These cork-stoppered, green vintage glass bottles come in assorted shapes and textures, and add delightful detail to vintage, classic and themed wedding tables and centerpieces. Measuring 5 inches tall and offered in a set of 10, the assorted styles of the bottles add depth and variety to any display. Use them as mini vases and add flowers to your decor. Display them with large vintage clear glass bottles to create a truly eye-catching centerpiece. Each bottle measures 5 inches tall. Each Bottle comes with a removable Cork. Opening diameter: Approx 0.5 inches. COMPLETE LOOK - This set of 10 unique pressed glass bottles is the ideal event pack for wedding planners and restaurateurs. MINI GLASS BOTTLES - Each bottle measures 5 inches tall and comes with a cork stopper. The opening of the bottle has a diameter of approximately 0.5 inches. 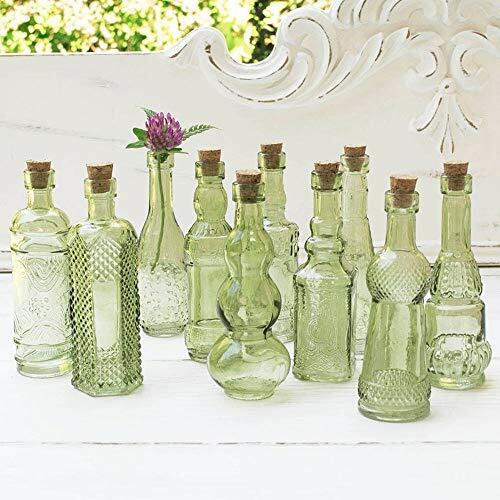 ASSORTED STYLES - Each bottle is different giving you a beautiful assortment of shapes and styles.HIGH QUALITY - These vintage inspired bottles are made of high quality antique styled green glass. VERSATILE PURPOSES - The potential uses for this item are limitless. Use as a small bud vase, a sand holder, message bottles, wedding favors, mini treasures holder, table decor, DIY projects, etc. HIGH QUALITY - These vintage inspired bottles are made of high quality antique styled green glass. Discoveries Egyptian Imports Genie Bottle, Made in Egypt and Packaged in Decorative Hieroglyphic Box - Green - 5"
Axe Sickle 36 Pcs 20ml Cork jar Glass Bottles,DIY Decoration Mini Glass Bottles Favors,Mini vials Cork,Message Glass Bottle Vial Cork,Small Glass Bottles Jars Corks, Wedding Decoration, Party Favors.